Boeheimâ€™s response was that he had not talked to Paul Harris in two weeks and that â€œhe told me that the week before the Oklahoma game.â€ Way to check your facts before throwing unconfirmed speculation out in the public domain Coach. These are the facts: The Syracuse University Coach (who is in the Hall of Fame) decided that he would declare on behalf of Paul Harris that Paul Harris had entered the Draft. Paul Harris had not actually planned to enter the Draft. Boeheim didnâ€™t bother asking Paul Harris whether he intended to enter the Draft. Boeheim decided that it would be more prudent to just go ahead and enter Paulâ€™s name without speaking to Harris for two weeks. Boeheimâ€™s excuseâ€”Paul didnâ€™t return my calls. Perhaps Harris didnâ€™t return those calls because he was justifiably despondent. After all, Coach Boeheim wouldnâ€™t play him even though he is a superior rebounder, defender, and athlete. Nonetheless, a failure to return a phone call doesnâ€™t sound like an invitation to send out a press release that one of your players has declared for the Draft. Itâ€™s time someone called out Boeheim on this. This is a Coach pushing his own agenda; an agenda that doesnâ€™t include Paul Harris. 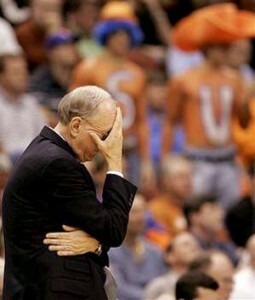 Jim Boeheim should be ashamed of himself. The Basketball Hall of Fame should give Boeheim his plaque back. Donâ€™t tell me that the NCAA is where caring happens. Might want to check your “facts”. Here’s an actual quote from Boeheim, “We don’t know that they [Harris, Flynn and Devendorf] put their names in, only that they planned to. And as long as they don’t sign with an agent, any of them can come back.” This directly conflicts your assertion that Jimmy B actually declared Paul for the draft, which I don’t believe is even possible since the players have to submit in writing their declaration for the draft, unless they’re automatically eligible, which Paul is not since he’s a junior. And apparently Jim had asked Paul if he intended to enter. And Paul said yes. But that doesn’t mean Paul didn’t change his mind. So Jim writes press releases now? Am I the only one that has a hard time believing that? So Paul is third (behind SU’s other two stars) in minutes played and minutes per game, but he never gets any run? Can’t blame Jim if he wanted to bench Paul though, he took the second-most 3’s on the team and was the absolute worst 3-point shooter on the team. Those are actual facts. What’s your agenda? I’m not sure if Paul has actually declared or not yet. The University wouldn’t write a press release including Paul’s name without authorization from the program (read: Boeheim). Thus, it is reasonable to conclude that Boeheim authorized the use of Paul’s name in the Press Release without speaking to him for 2 weeks. Boeheim failed to get confirmation that Paul intended to enter the draft and the press release was based upon something that was not confirmed. That is negligent at best and reckless at worst. Boeheim’s agenda: he doesn’t like Paul Harris and doesn’t want him on the team. What he tells the press doesn’t tell the story. A play on words like “These are the facts”? They appear to the trained eye to be equally as accurate, err, inaccurate. So Boeheim isn’t writing press releases now, he is just Peter at the pearly gates of all SU athletics press, passing judgement on what can and cannot pass through his gateway of communications. I’m sure the athletics communications department had absolutely nothing to do with that release. And since the use of Paul’s name is untouchable without the expressed written consent of Jimmy, it’s completely reasonable to make the giant leap to assume that he gave said permission. So Jimmy is a liar, what he told the press is bull, and the story you made up as well as the assumptions and giant leaps you made are 100% true? Someone that uses “negligent” and “reckless” should have a better understanding of what is “reasonable to conclude”.